These highlights do not include all the information needed to use ADDITIVE SOLUTION FORMULA 3 (AS-3) safely and effectively. See full prescribing information for ADDITIVE SOLUTION FORMULA 3 (AS-3). 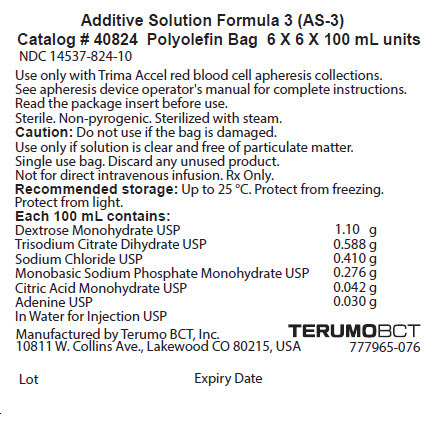 ADDITIVE SOLUTION FORMULA 3 (AS-3) is connected to the tubing set used for an apheresis RBC collection procedure after the collection has been completed. For automated RBC procedures, the recommended dose is determined by the apheresis device and metered into the tubing set by the apheresis device. To add the product manually, refer to the apheresis system operator's manual to determine the recommended dose. 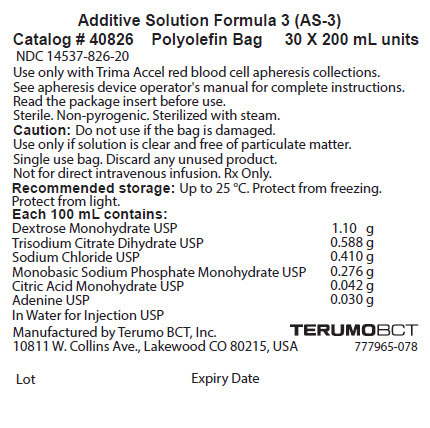 Directions for connecting the ADDITIVE SOLUTION FORMULA 3 (AS-3) bag to the apheresis device. Connect ADDITIVE SOLUTION FORMULA 3 (AS-3) after the collection is over and the donor is disconnected. For automated addition of the product, the system will prompt you to connect the bag. Remove the overwrap by pulling down at notch, and remove the AS-3 bag. Ensure that the solution is the ADDITIVE SOLUTION FORMULA 3 (AS-3) and is within the expiration date. Inspect the bag in good light. Do not use if the container is damaged, leaking or if there is any visible sign of deterioration. Check for leaks by gently squeezing the bag. If leaks are found, discard the bag. Inspect the solution in good light. Use only if solution is clear and free of particulate matter. Bags showing cloudiness, haze, or particulate matter should not be used. Connect ADDITIVE SOLUTION FORMULA 3 (AS-3) after the collection is over and the donor is disconnected. Seal the RBC product lines as close to the cassette as possible. Remove the overwrap by pulling down at notch, and remove the ADDITIVE SOLUTION FORMULA 3 bag. 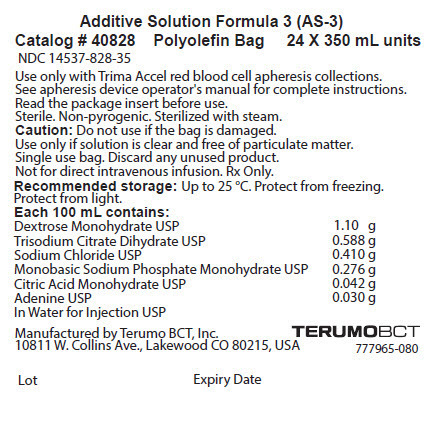 100 mL, 200 mL and 350 mL ADDITIVE SOLUTION FORMULA 3 (AS-3) products are sterile solutions in a Polyolefin bag. Each 100 mL contains: Dextrose Monohydrate USP 1.10 g; Trisodium Citrate Dihydrate USP 0.59 g; Sodium Chloride USP 0.41 g; Monobasic Sodium Phosphate Monohydrate USP 0.28 g; Citric Acid Monohydrate USP 0.42 g; Adenine USP 0.03 g; and Water for Injection USP. DO NOT INFUSE ADDITIVE SOLUTION FORMULA 3 (AS-3) DIRECTLY TO THE DONOR. Verify that the AS-3 bag has been securely attached to the system tubing set. Use aseptic technique throughout all procedures to ensure product quality. Citrate reactions or toxicity may occur with the infusion of blood products to patients. The recipient of the blood containing citrate should be monitored for the signs and symptoms of citrate toxicity. The signs and symptoms of citrate toxicity begin with paresthesia, a "tingling" sensation around the mouth or in the extremities, followed by severe reactions that are characterized by hypotension and possible cardiac arrhythmia. Citrate toxicity may occur more frequently in patients who are hypothermic, have impaired liver or renal function, or have low calcium levels because of an underlying disease. ADDITIVE SOLUTION FORMULA 3 (AS-3) has not been studied in controlled clinical trials with specific populations. ADDITIVE SOLUTION FORMULA 3 (AS-3) is designed to be added to packed RBC collected in apheresis procedures, and acts to preserve and extend the shelf life of packed RBC products for later transfusion to patients. The solution is intended to be metered by an apheresis device during apheresis procedures or added manually after a collection. Each 100 mL of ADDITIVE SOLUTION FORMULA 3 (AS-3) contains: Dextrose Monohydrate USP 1.10 g; Trisodium Citrate Dihydrate USP 0.59 g; Sodium Chloride USP 0.41 g; Monobasic Sodium Phosphate Monohydrate USP 0.28 g; Citric Acid Monohydrate USP 0.42 g; Adenine USP 0.03 g; and Water for Injection USP. ADDITIVE SOLUTION FORMULA 3 is available in three volumes: 100 mL, 200 mL and 350 mL. The 100 mL bags are individually wrapped with a clear plastic film. Six individually wrapped bags are then vacuum-sealed in a foil pouch, which serves as a vapor barrier to prevent water loss during storage. After you remove the individual solution bags from the foil pouch, you can either leave them in the clear plastic film or remove and discard it. Once the foil pouch has been opened, use all six of the solution bags within 2 weeks. The 200 mL and 350 mL bags are individually wrapped with a clear plastic film. These larger volumes do not require the additional vapor barrier. Once the clear plastic film has been removed, use the solution within 2 weeks. The Polyolefin bag is not made with natural rubber latex. The bag is made from a multilayered film. It contains materials that have been tested to demonstrate the suitability of the container for storing pharmaceutical solutions. The bag is nontoxic and biologically inert. The bag-solution unit is a closed system and is not dependent upon entry of external air during administration. The in vivo and in vitro quality of RBCs stored for 42 days in ADDITIVE SOLUTION FORMULA 3 (AS-3) storage solution has been assessed in three clinical studies. A single-arm, multicenter, in vivo study was conducted to assess the recovery of radiolabeled RBCs 24 hours post infusion. Acceptability of in vivo recovery was determined using established FDA-CBER acceptance criteria. Double collection RBCs (dRBC) were collected using the Trima Accel system and stored in ADDITIVE SOLUTION FORMULA 3 (AS-3) solution for 42 days, then radiolabeled with 51Chromium, and transfused back to the original subject. Table 2 summarizes the in vivo recovery data. Of the 27 units transfused, 26 had > 75% RBC recovery. FDA-CBER Criteria for Acceptable Recovery: Radiolabeled RBC recoveries should average at least 75%, with a standard deviation of at most 9%. In addition, the 95% one-sided lower confidence limit for the population proportion of successes should be > 70%, with success being defined as an individual red blood cell in vivo recovery of at least 75%. No more than 3 out of 24 data points may have less than 75% radiolabeled red cell recovery at 24 hours post infusion. The primary outcome was met for RBCs collected on the Trima Accel system and stored in ADDITIVE SOLUTION FORMULA 3 (AS-3) storage solution. The in vitro quality of RBCs collected in single RBC collection (sRBC) and dRBC procedures using the Trima Accel system was assessed after 42 days of storage in ADDITIVE SOLUTION FORMULA 3 (AS-3) solution in a multicenter, paired study. In vitro quality was determined using established FDA-CBER acceptance criteria. The quality of RBCs stored in ADDITIVE SOLUTION FORMULA 3 (AS-3) solution (test) was compared to RBCs stored in plasma (control). Table summarizes the in vitro RBC quality data for collection on the Trima Accel system and storage in ADDITIVE SOLUTION FORMULA 3 (AS-3) solution. %Hemolysis = (100 – RBC Product HCT)* Plasma Hgb / (RBC Product Hgb). where the difference was expected to be less than or equal to 0.5 pH units. ATP retention was determined for test and control units across all sites and calculated as ATP Level on Day 42 / ATP Level on Day 0. Normalized potassium was calculated by determining the total number of millimoles of potassium leaked from the RBCs into the supernatant volume and dividing this by the total hemoglobin in the stored product. FDA-CBER Criteria for Acceptable Day 42 Hemolysis: Zero failures (hemolysis ≥ 1% after 42-day storage) out of 60 test units that were not excluded from analysis by the Extreme Studentized Deviate test with α=0.05, which satisfies the binomial distribution testing requirement that, with 95% probability and a one-sided 95% lower confidence limit, the post-storage hemolysis was less than 1% per unit. There were 0/68 sRBC test units and 0/70 dRBC test units with Day 42 hemolysis ≥ 1%. No donors were excluded as hemolysis was < 1% for all test units. Therefore, the primary objective was met for RBCs stored in ADDITIVE SOLUTION FORMULA 3 (AS-3). The in vitro quality of sRBC and dRBC units collected using the Trima Accel system was assessed after 42 days of storage in AS-3 solution in a multicenter study. The quality of RBCs was compared between sRBC and dRBC units, and between units A and B of the dRBC collection. Table summarizes the in vitro RBC quality data for collection using the Trima Accel system and storage in ADDITIVE SOLUTION FORMULA 3 (AS-3). All outcome measures are shown after 42 days of storage in AS-3 solution. All comparisons were performed using a Student's T-test. A 2-tailed paired comparison was performed for dRBC A v dRBC B. A 2- tailed, two sample, equal variance comparison was performed for sRBC v dRBC units. Osmotic fragility was measured as percent hemolysis in 0.55% saline at Site 1 and as the percent saline at ≥ 50% hemolysis at Site 2. The primary outcome of this study was to demonstrate RBC collection, storage, and viability in vitro. The sRBC and dRBC units collected were comparable. The hematocrits, blood gasses, ATP, potassium, total hemoglobin, and osmotic fragility were within acceptable ranges following storage. Two statistically significant differences were identified between the A and B units in the dRBC collection at Day 42 (sodium and plasma free hemoglobin), but these differences were not clinically significant. There was no difference between dRBC units in hemolysis following storage in ADDITIVE SOLUTION FORMULA 3 (AS-3). A statistically significant difference was identified in the osmotic fragility of RBCs stored in ADDITIVE SOLUTION FORMULA 3 (AS-3) following sRBC collection or dRBC collection at Day 42, but the difference was not clinically significant. All the RBC units collected averaged less than 1% hemolysis on Day 42. These results are consistent with US and European guidelines for hemolysis on transfusion. ATP recovery was greater than 70% of all units, which is predictive of good in vivo viability, and potassium levels on Day 42 average less than 50 mEq/L indicating good RBC membrane stability over the storage period. ADDITIVE SOLUTION FORMULA 3 (AS-3) is a clear solution supplied in sterile and non-pyrogenic Polyolefin bags. Use only with Trima Accel red blood cell apheresis collections. See apheresis device operator's manual for complete instructions. Caution: Do not use if the bag is damaged. Single use bag. Discard any unused product. Not for direct intravenous infusion. Rx Only. Recommended storage: Up to 25 °C. Protect from freezing.